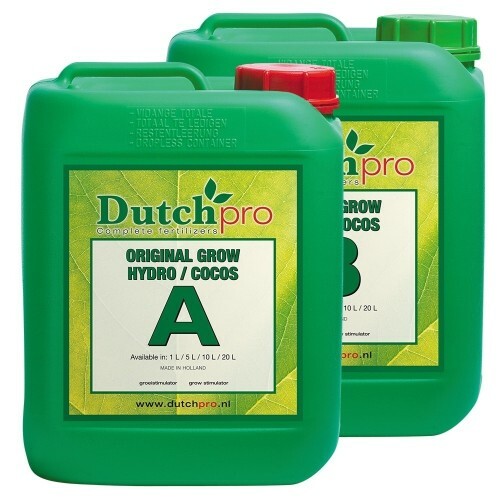 Dutch Pro Hydro/Coco Grow for soft water areas is a highly concentrated base nutrient in a 2 part system. Ideal use is within a coco or hydro medium for super growth of plants that is scientifically developed to work throughout the vegetative growth phase. Dutch Pro Hydro/Coco Grow is a complete, balanced source of macro and micro nutrients and is designed to energize and stimulate extreme growth, strength and overall health of plants throughout their vegetative growth all the way to bloom. This balanced and complete feed mixture works miracles with soft water and will generate healthy, strong and vibrant plants in either coco or hydro grow mediums. Dutch Pro Hydro/Coco Grow for soft water develops and helps plants thrive with strong roots for proper nutrient uptake. Continuous feed base that has all essential macro and micro nutrients. Canna CalMag AgentCanna Calmag Agent has been developed to to increase the EC of soft water. If you ..
•	Highly concentrated for optimal use•	Great base feed nutrient with essential macro and micro nutri..